The seemingly romantic encounter of two strangers in a tropical Hawaiian paradise, but there is a small twist with the naughty little habit that one of them has. The film was shot entirely on location in Ka'anapali Beach on Maui, Hawaii in 2004. 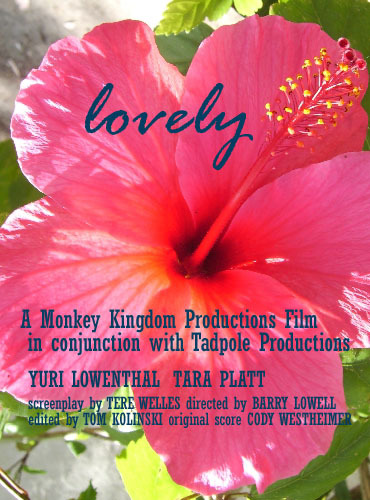 Script by Tere Welles, directed by Barry Lowell, produced in conjunction with Tadpole productions and starring Monkey Kingdom Productions' Tara Platt and Yuri Lowenthal. LOVELY made the festival rounds included being featured at The Reel Backwoods Film Festival.